Green buildings have become the new buzz word, with several companies focusing on strategies that will reduce energy costs while preserving the environment. As the push for net zero buildings continues to increase, the conversation has evolved to consider not only how these buildings are better for the environment, but for our overall health. Residents and employees want to have an indoor space that is not only green, but comfortable. So what does it mean to have a healthy building? It is about taking the green building to the next level, and incorporating elements that are not only aesthetically pleasing but promote physical health and emotional well being. These elements and features of a healthier building may include solar panels and windows to bring in more daylight, living bio walls and plants to clean the air of toxins and provide oxygen, and a focus on clean ventilation. With people spending upwards of 90% of their time indoors, the air we breathe becomes fundamental in increasing the overall health of a building. Companies committed to creating both a healthier building and net zero space, should take a deeper look at the equipment that is used for their heating and cooling. The key is finding a system that not only makes the best use of hardware to harness and store energy, but to include having a constant flowing fresh air source. 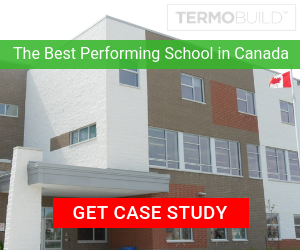 Smart Floors with Termobuild, is a prime example of a thermal system that has a positive impact on all three areas of; environment, health and emotional wellness. These floors work with fan assisted ventilation to push fresh air through a series of ducts that are placed within a hollow core slab structure. As air passes through the ducts, the concrete warms or cools the fresh air before supplying it to the occupied space. The end result, fresh air, stored energy, and a heating and cooling system that provides the desired level of comfort. Help us continue the conversation on healthier green buildings by sharing this post.